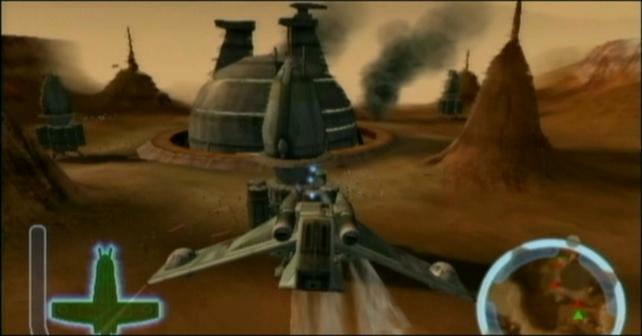 Fairly good graphics overall give The Clone Wars eye pleasing game play for the most part. The detail on the characters in the cinematics is equally looking. Great effects with dust in certain levels make visibility hard, but realistic. The 30 frames per second is not as impressive as other games with top notch graphics, and you will notice from time to time when the game lags for a few seconds here and there. Overall, the graphics in this game are nothing special, but not disappointing either. Great Star Wars background music is no surprise, along with great sound effects. The sound is fairly nice on any standard stereo system but even with surround sound it�s not much better. The voices for the characters are what you�d expect, not the real actors from the movie, but still done well. Yoda�s voice isn�t bad, but there are a few times that it sounds fake. The Game play is very enjoyable, although several of the missions seem similar and may get boring after a while. 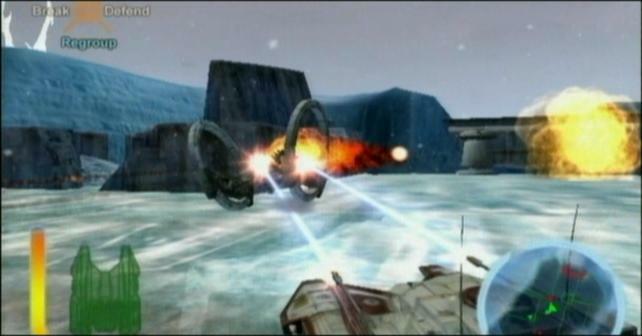 The standard game play puts you either in a Hover Tank, or a Republic Gunship, which you will get the hang of quickly and easily. 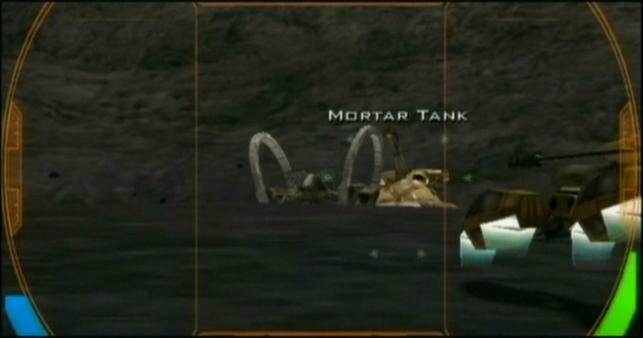 Other missions put you on a speeder bike speeding through a canyon or the best part: On foot with a light saber. 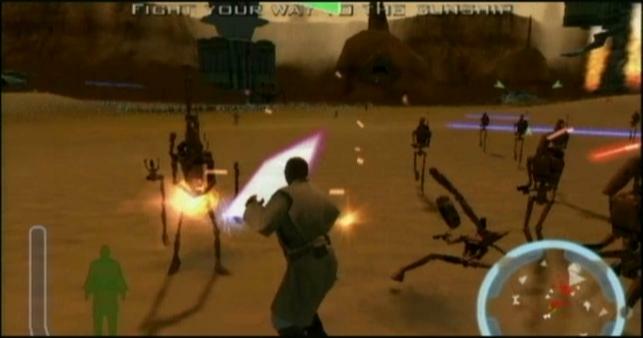 You are able to control Mace Windu, Obi-Wan Kenobi, or Anakin Skywalker, depending on the mission. Each of them have their own techniques of combat with a light saber, but you are rarely on foot for very long before you are behind the controls of another vehicle. Similar to Rogue Leader, many missions have you change vehicles in the midst of the mission, letting you accomplish a variety of tasks. The various game play types give this game a unique feel and keep you from getting bored of the same vehicle or mode. There are many special features in this game, but the ease in getting them makes them somewhat obsolete. To unlock special features, you must complete bonus tasks or objectives in one-player missions. There are three possible bonuses for each mission, 48 bonuses in total. Through the first half of the game, you first unlock different areas to play in for multi-player modes then you get into the good stuff. Other special features include a short, 10 minute documentary on the making of the game, a sketchbook and a music player, much like in Rogue Leader. Also available is a unit viewer to view all the units you get to control, fight, or see in the game. As for the cinematics, you can view them in the options menu, and also watch some previews of two other Star Wars titles. The final bonus is a total surprise, and very unexpected but enjoyable. You get a new character to use in the Jedi Academy multi-player stage, and I won�t say anymore than that. The single player mode in The Clone Wars is way too fun, and there had to be a catch: It is extremely short. Most people will be able to beat the one player mode within the first week of owning the game. It will take some time to obtain all the bonuses, but even that is a fairly easy task. There are three different skill levels, if you�d like to play the game through again on a harder level. This may get boring because you have already beaten it, but it is one heck of a challenge to even beat the game on Jedi Knight, the medium skill level. The multi-player mode saves the lasting appeal for this game. Without the multi-player modes, this game would be worthless. With four different modes there is plenty to do with your buddies. First of all, there is a duel, you choose your vehicle, and have fun on several areas destroying each other to a certain score or time limit. Secondly, there is a Control Zone, otherwise known as King of the Hill. In the center of the area is a ring that you must keep control of to gain points. The third mode is the most complicated and time consuming, making it my favorite part of the game. This mode is a strategy style game called Conquest. Once again you choose your vehicle and you must take control of outposts, build turrets and units, and destroy your opponent�s headquarters, while defending yours. This is a two-team game, so it is either one on one, one on two, two on two, or one on three. The last mode is a co-op style game play that puts all players in the center of an arena in a vehicle and the person with the most kills after all players are defeated, wins. 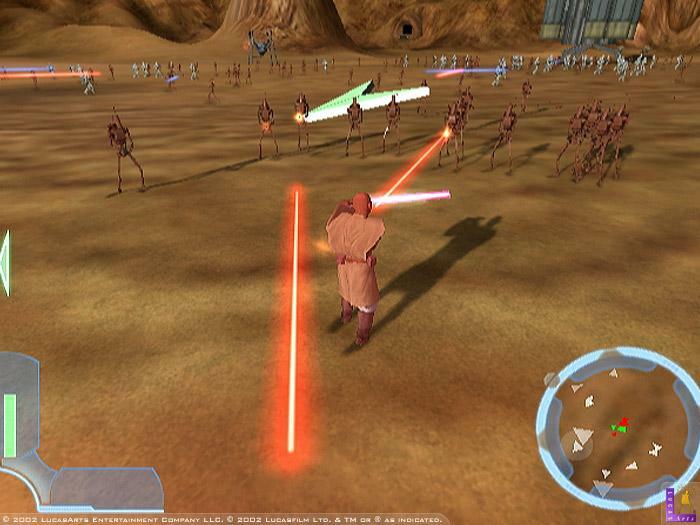 Another version of this mode is unlockable, and puts you in the battle of Geonosis as a Jedi with a light saber, with the same concept, which is another popular mode in the game. Without friends to play this game with, it won�t last long, but with friends; this game will not get boring. Various vehicles and modes of play keep you from getting bored. with tons of different ways to whoop on your friends!